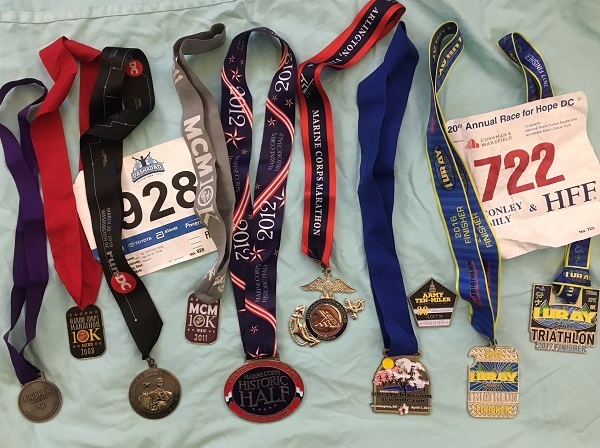 After running five marathons in the United States, I decided to make my sixth attempt at 26.2 miles 42.2 kilometers an international affair. 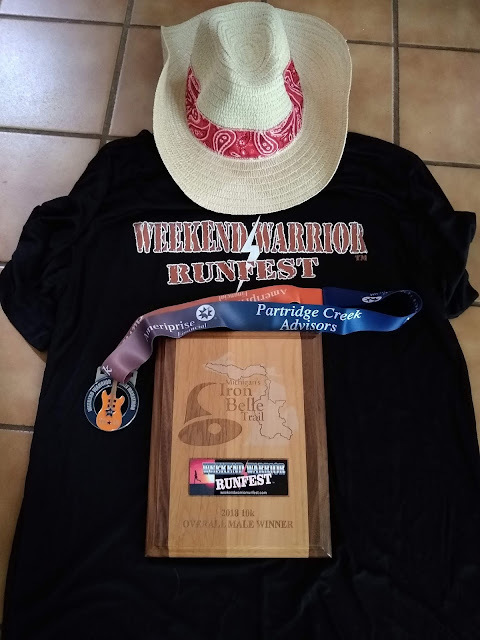 In my quest to qualify for Boston, I wanted a fast course, a field that wasn't too crowded or too sparse, and something close enough to drive to from my home in the Detroit area. Using findmymarathon.com, I narrowed it down to the Toronto Goodlife Marathon and the Mississauga Marathon, both of which fell on May 6. Both marathons have similar statistics for percentage of Boston qualifiers and PR scores, and both have net downhill, point-to-point courses. 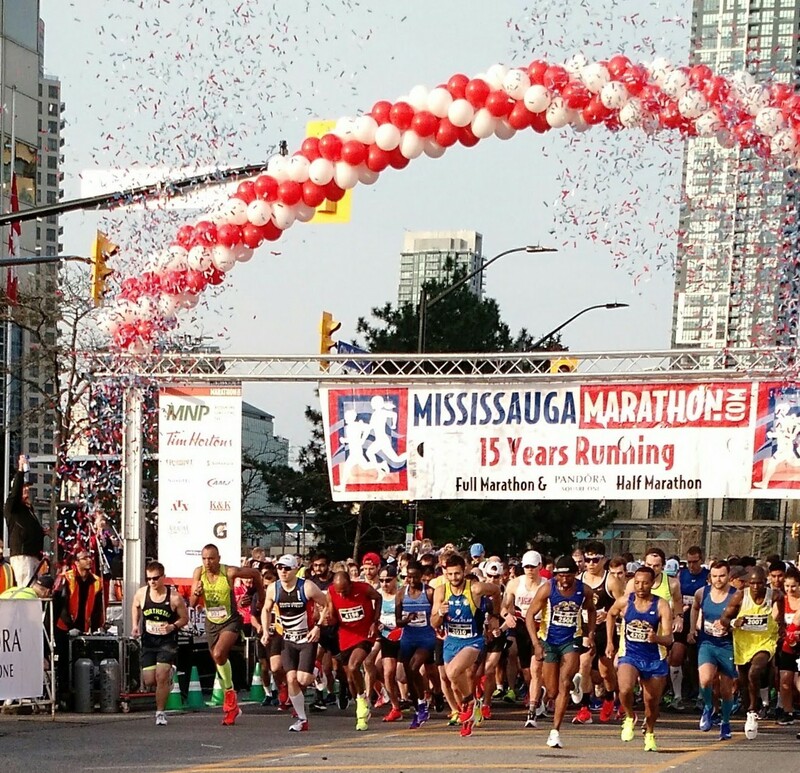 I settled on Mississauga because it has about half as many runners as Toronto. Mississauga is the third most populous city in Ontario and is next door to Toronto, so I knew I would have opportunities for good food and sightseeing in both cities after the race. 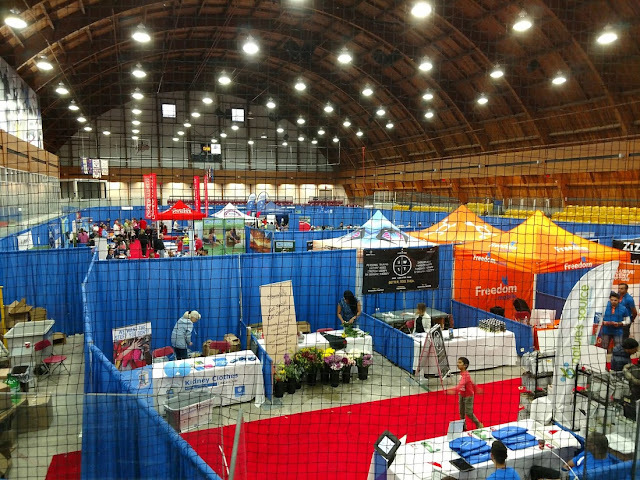 The pre-race expo was held at the Port Credit Arena in Mississauga. The ice arena has an amazing wood ceiling, and I bet it would be a fun place to watch a hockey game. The arena offered free parking for the expo, which was nice for someone like me who was not familiar with the city or its parking. The expo itself seemed well run, but I didn't like how the race organizers made runners walk through a maze of vendors before picking up the race packets at the end of the maze. I'm not normally a fan of spending a lot of time (or money) at expos, so I wanted to just pick up my packet and go. My kids loved the sign-making station, though, and did make a couple of great signs that I appreciated seeing about halfway through the marathon. The marathon began in the city's center and ended along the shores of Lake Ontario. Unlike larger marathons, there was ample area to jog and warm up, and I was able to wander up to the starting line only a few minutes before the start instead of being herded in a half hour beforehand. Parts of the course ran along main roads with strip malls, but much of the race went through beautiful, tree-lined residential neighborhoods. It also wound through the University of Toronto's Mississauga campus, and the last several kilometers were along the Lake Ontario Waterfront Trail. The course was net downhill, but there were several uphills throughout the race. The marathon's website said there were "small inclines" at 10 kilometers and 24 kilometers, but it felt like the last 15 kilometers were full of rolling hills. Even though I had looked at the course elevation maps beforehand, these uphills seemed bigger than they probably were considering I had been traveling downhill for so long. I also train in a pretty flat area of Michigan, so my opinion of a "small incline" apparently is not the same as a Mississaugan's. The course had fifteen aid stations, all but one had Gatorade, and two had energy gels. The aid stations were spaced out every 2 to 4 kilometers (roughly every 1.25 to 2.5 miles). The aid stations were well staffed, and I never had to slow down to wait for someone to grab a drink from a table. The course also had plenty of port-o-potties for those who needed them. There weren't a ton of spectators cheering on the runners, but the University of Toronto campus and some neighborhoods had decent crowds. The last few kilometers near the finish were full of supporters, which I appreciated as I struggled to keep my goal pace. The course itself was pretty well marked, but apparently there was a mix-up that made a few lead runners run farther than a full marathon. By the time I reached that point of the race, the problem had been fixed, as my total kilometer reading on my GPS watch confirmed at the end of the race. The last 10 kilometers (6 miles) are always the toughest part of a marathon, but most of that stretch was near the shore of Lake Ontario, and the scenery and cool air off the lake made it easier for my mind to wander. The finish chute area was great. It was lined with spectators screaming encouraging words, and the announcer did announce all finishers' names and hometowns as they approached the finish line (this is a touch that I always enjoy). But the best part about the finish was looking down at my watch and confirming that I finally had achieved a Boston qualifying time (3:18:48). The post-race area for finishers was OK. It didn't have a ton of food options, but there were more than enough granola bars and bananas to refuel. I did appreciate the picnic tables, where I was able to sit down to eat and to use the table as support to stand up after eating. The finish area also had changing tents so runners could change into warm clothes. They of course provided space blankets, which came in handy as the weather had turned from sunny to cloudy and cool right when I finished. My only gripe about the finish area was the long walk to the shuttle buses that took us back to our car. Normally, the walk would be fine for me, but it was the last thing I wanted to do after a marathon. It would be nice if they could figure out how to get the buses a little closer to the finish in the future. Overall this was a good race, and not just because I set a PR and achieved a major goal. I actually preferred kilometer markers because each segment seems more manageable than it does with longer miles. The course wasn't too challenging, and I had fun exploring Mississauga and Toronto in the hours/days after the race. If I lived in Ontario, I would likely run the marathon (or half) again. I probably won't because I would like to visit new places and would like to visit Toronto/Mississauga for a vacation again without tired legs. 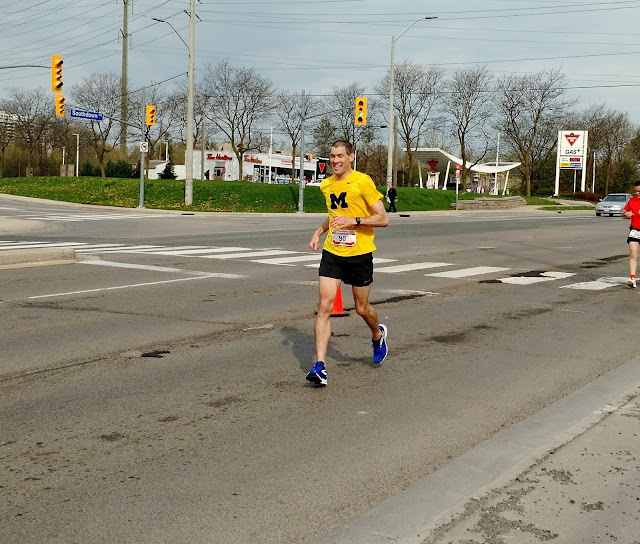 I definitely would recommend the Mississauga Marathon to anyone who wants a destination marathon, but make sure you run on real hills during your training.